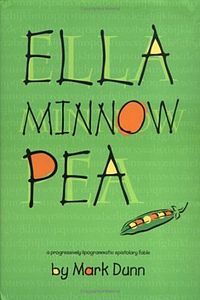 Ella Minnow Pea: A Novel in Letters takes place on the island of Nollop, supposedly named after the (not very nice) man who came up with the sentence "The quick brown fox jumps over the lazy dog," one of the shortest sentences in English to use all 26 letters. To commemorate this man, the small island erected a cenotaph with the words on there to look down at all people for posterity. The story is told in a series of letters between the Minnow Peas and their friends and family that live in different parts of the island. Only, one day, the letters start falling off the cenotaph. Nollop is run by a very totalitarian regime, and when the letter Z falls, the higher-ups go into a closed door meeting to determine what it could mean. Apparently, it means much more than that the glue needs to be replaced. The higher-ups decide that the letter Z fell because Nollop no longer believes it to be necessary. And so no one on Nollop can use the letter Z any more; violations are dealt with in a very strict manner - after three violations, you are either deported or killed. All the books are removed, all songs are banned, and you can no longer call 12 of anything a dozen. The letters become shorter, less complex, and more difficult to understand as the letters continue to fall. The citizens deal with this as they have dealt with so many nonsensical laws before, with anger and fear but the inability to voice their opinions without great risk to themselves and their families. And as the letters continue falling, they find their ability to comply, cope and communicate more and more difficult. Their only hope is to create a sentence that is even better than Nollop's, that uses every letter of the alphabet but is 32 letters long or less. It's interesting to me that Dunn chose to structure this book the way that he did. He could have made it very lighthearted and fun and satirical, which is really what I was expecting. But in actuality, there was a lot that was serious in this novel. The totalitarian regime was faceless and frightening, the characters became more and more isolated, and the consequences were quite extreme. In the end, Ella is nearly all alone, abandoned by her family and friends, and worried about becoming too friendly with anyone else, in case they report her for using a forbidden letter. I enjoyed this book even though it was more serious than I initially thought it would be. And I don't mean that it was serious, because it wasn't. It was very whimsical, mostly because it's hard to take seriously a regime that believes some jerk is a god and that letters falling means that those letters must be eliminated from life. BUT there were definitely parts that were very sad and upsetting, too. What was most impressive was how the Nollopians stretched their vocabularies! While removing some letters from the alphabet (especially D! Ahh, no more past tense!) made communication very difficult, the Nollopians were quite skilled at finding synonyms for commonly used words, and I'm sure those synonyms were very appreciative of being dusted off and used again. Teese letters are also mie solass. Mie emollient! Ant I Tang ewe 4 tem. Insitentallee, ewe are propaplee reating mie last letter to ewe. It is now simplee too tiring to write. To sae what I most sae in language one mae onterstant. Whew, it took me a while to struggle through figuring out what that one meant! The characters weren't particularly memorable, but they aren't really the point of this book. It was much more an exercise in creativity and a message against censorship. Lots of fun, especially for summer! I have had this book for the longest time, and my daughter picked it up recently and read it. That should have given me the impetus to read it straightaway, because she is usually a really good judge of what's good, and what's not. But alas, I still haven't read the book :( Your review makes it sound like so much more than a lighthearted romp through alphabetical chaos, and into something more scary and menacing. I need to read this soon! Great review today, Aarti! So many good books to read in your house, Heather! So it's understandable that you haven't gotten to this one quite yet. Hahaha, yes, it's a fun read, though the end gets tiring! The political content took me by surprise, too. But I really liked how that turned what could have been a gimmicky book into something a bit more thoughtful. Yes, it made it much more impressive to have plot AND wordplay! This has been on my list for ages. I love books with wordplay, and the idea that the author uses it for more serious ends makes this even more appealing. This would be right up your alley, then! I read this a few years ago and remember being exhausted by the end, too. Those final letters are hard work! I loved this book! It's so clever. I think if I had read had read that sentence first I'd think the book was too difficult to attempt, LOL, but by the time you get to that part of the book you're so invested, AND in and of itself it was such a creative way to demonstrate or show what the community was dealing with! Yes, it was a really thoughtful way of dealing with censorship. I read this a long time ago, and it always excites me to see it mentioned anywhere. It's high time for a reread. I am definitely adding this to the wish list. It sounds like such a fun read. Censorship is a relatively common theme; you know, there are many books dealing with it, in some way or the other. But this according to me, was the most creative, fascinating and fun way to deal with it. I loved this book! I definitely enjoyed this book. It's not a long book so I read it during one of the read-a-thons, all in one gulp basically. I too was impressed by how the Nollopians got creative with language in order to get around the restrictions. I really enjoyed the wordplay in this book too and the extra dimension it took on with censorship. Reading my own review, I'm surprised I haven't read it again - it was a lot of fun, but hasn't stuck with me as well as I expected. I read this a few years ago and really enjoyed it - I gave it to my mom, and she started using it in her high school Contemporary American Lit classes. I can't even begin to imagine how he was able to write this book!